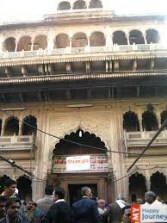 Location: Dedicated to Lord Ranganatha, Rangji Temple is one of the outstanding temples in Vrindavan. 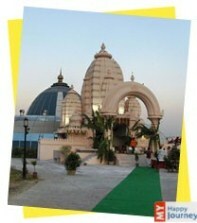 Description: Rangji Temple is a huge stricture constructed by one of ardent devotees of Lord Krishna. 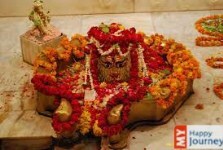 The deity worshipped in the temple is Lord Ranganatha, another name of Lord Vishnu, along with his wife Goddess Laxmi. There are many small shrines adjoined to the main temple. It includes the shrines dedicated to Alwars, Sesa-Sayi Ananta Sayanam and Tirupati Balaji. 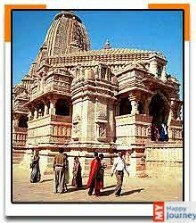 The creation of this shrine took seven years which began in 1845 and completed in 1851. 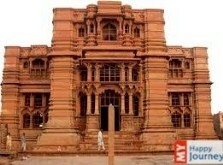 At that time, it was erected by Seth Radha Krishna and Seth Govindadasa of Chennai at a cost of nearly 45 lacks which becomes approx, 4.5 million, if evaluated today. 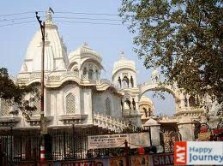 You may see a big garden and a tank enclosed by the outer wall of the shrine. The six-storey high shrine houses eight beautifully carved Gopurams using South Indian style of architecture. Activities: During the month of Chaitra as per Hindu calendar, a huge Brahmotsava, the Festival of Sri Ranganatha, is celebrated in the shrine from 2nd to 12th day of this month. In this ten day long festival, an Utsava Murti is carried out in the procession twice, once in the morning and once in the evening, till the last day of the festival.